One of the most important tasks ahead of you – to work out a relocation budget before all else to get a better idea of where you stand from a financial point of view and to estimate the cost of moving. A well-structured moving budget should also warn you if an individual pre-move job demands more money for its completion than you allocated to it in the very beginning. This way, you will be given the chance to monitor your moving expenses closely and interfere before things get out of hand. Create a moving checklist and fill it up with all the tasks you just need to complete before, during and after the house move. The personal moving and packing calendar will keep reminding you of what it is that you are expected to do next so that you won’t forget to take care of an important job. A week-by-week moving checklist will enable you to win more time by not losing precious hours or even days by wondering what it was that you had to do. Keep all the move-related jobs in your calendar prioritized too. You surely won’t enjoy moving into a new home that has neither electricity nor running water, will you? Amidst the myriad of tasks to be done before the date of the move arrives, don’t forget to transfer utility services to your new house or apartment. Get in touch with the utility companies in your destination city at least 2 weeks prior to Moving day and see to it that electricity, water, and gas – the 3 major utilities you need to take care of first – are already up and running before you initiate the move-in process. You can always get cable TV, phone service, and Internet access a bit later. Important documents (personal, employment, housing, legal, financial, motor vehicle documents, and so on) should stay with you at all time – there’s no question about this. Visit your family physician and acquire all the necessary documents and medical records that you will need to register with a new health care provider in the destination city. And what about your pet’s immunization records? If you have school-aged kids, then acquire their school records as well. Moving a dog to a new home can be a bigger challenge than you think. The very first thing you should do is try to keep your animal friend calm before the move by keeping their routine as unchanged as possible and making sure they stay 100% safe, especially during the chaotic day of the move. The local or cross country mover won’t agree to transport your dog for you, so you remain in charge of that not-so-easy job – the best way is to move your dear pet in the car with you. After the move, you just must turn your attention to your lovely pet friend as the post relocation acclimatization period proves hard for some dogs – your priority task is to keep his or her anxiety, stress and confusion to a minimum by showing how much you love them. Moving a cat to a new home can be a formidable task from start to finish as cats are extremely sensitive animals that dislike changes of any sort. Keep your pet’s routine the same to keep them calm, safe, and content. Also, before the actual move, take your cat to see a vet and discuss with the pet doctor the possibility of using anti-anxiety medications to have a fairly normal relocation trip. Remember that to move your cat safely, you’re going to need a specialized pet carrier to guarantee their comfort and security on the road. Moving antique furniture is a task better left to experienced professionals due to the high chance of you damaging your valuable or even priceless furniture pieces forever during a self-move. Expensive and fragile is a bad combination when transporting household items, and antique furniture pieces are both. Professional packers and movers know that precautionary steps to take to protect antiques so that the actual transportation goes smoothly and headache-free. The stage of packing antique furniture for a move is crucial for the success of the entire operation with the techniques of initial protection, shock protection, and hard outer protection known only to the best specialty movers out there. First and foremost, keep clear of any common packing mistakes to ensure a smooth packing experience. A single error when packing up your home for a move could lose you both precious time and hard-earned money. Use professional packing materials as these will save you time and ensure the safety of your goods. Make certain all cartons are taped securely, top and bottom. Use carton sealing tape and not masking tape or duct tape. Label all cartons, label all fragile boxes as fragile. Cartons should be labeled for contents and destination on two sides of a carton to make it easy for your movers to identify where each carton is to go. The best way to label moving boxes is to think of a labeling system that will actually work great for you. Leave small file cabinets (2 drawers) as they can be moved full. Four drawer filing cabinets should be completely emptied. All lateral style cabinets must be completely emptied. Empty desk drawers. Desks often need to be turned on their side to get through doorways and loose items may fall out and be lost. Pack heavy items in small cartons, i.e. books, records and canned goods, etc. Fill all cartons to the top as half-filled cartons tend to crush. Do not, however, overfill cartons as rounded top cartons are hard to stack. Pack all items snugly into cartons using unprinted newspaper for fragile items. Use crushed paper to fill any gaps in cartons to prevent items from shifting. Place a protective bumper at the bottom and top of cartons you pack with fragile items. To make a bumper, simply take three loose sheets of unprinted newspaper and roll them together. Three to four finished rolls should fit across the bottom or top of a carton. Wrap paintings, glass and mirrors in paper pads and place in picture cartons. The picture carton should have a paper bumper on the bottom and on the top of the carton. Crushed paper should also be used to prevent shifting. Box all lampshades. They should be nested together in crushed paper. Silk lined lampshades should be packed one per carton. The silk lining will tear at the slightest touch. Some special items you own may need to be placed in custom-built wood crates for maximum protection. Custom crating services are charged extra but sometimes the well-being of priceless artwork, antiques, collectors’ items, wine bottles and other high-value items is more important than anything else when moving to another home. Make a list of all items you will need for a few days prior to and immediately following your move. These items should be separated and labeled, DO NOT MOVE. These items should include: soap, towels, toothpaste, toilet paper, cereals, bowls, plates and utensils, cups, sheets, blankets, and immediately needed clothes. Keep all your crucial documents – passport, driving license, bank cards, medical details and pet documents at hand – these can be very difficult to find in an emergency. Do not pack aerosols, flammable items, combustibles, or explosives in cartons to be moved, as your mover is not allowed to carry these items. You should collect these items throughout your home, and place them in one carton clearly marked for your car. Do not pack paint. A spilled can of paint can cause hundreds of dollars of damage to your other goods or the furniture area of the moving van. You would be responsible for damages if you have packed a can of paint that spills. Drain fuel from mowers and other machinery, and discard partly used cans of oil, paint, thinner, or other substances that might leak. Refillable tanks must be purged and sealed by a local propane gas dealer. Discard non-refillable tanks. TLC Moving and Storage do not permit shipment of any propane tanks. Have rugs and draperies cleaned. Leave both wrapped when they are returned from the cleaners. Think twice before dismantling your outside TV antennae; a new one may cost less than moving the present one. Third party servicing will likely be needed before moving such items as hot tubs, large-screen TV’s, and some exercise equipment. If you move to or from Boston Area, Brookline, Cambridge or Somerville you need a moving truck parking permit to ensure parking and close access to your residence on move day. 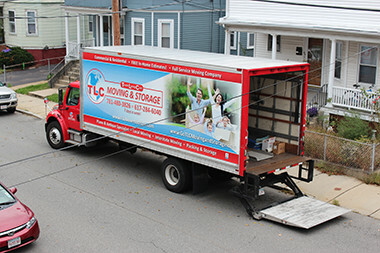 TLC Moving & Storage, is bonded by the City of Boston and will arrange for the truck permit while posting them in front of your residence, 48 hours in advance of your move. Please be sure to discuss potential parking permit needs with your sales associate. If you have any questions on how to pack items that were not listed, please contact us at 617-284-6040.